Day #20: Strolling into Spring! TNMBN Giveaway Event! It's Day 20 of Strolling Into Spring and today we're going to be talking about the amazing Kiddy USA City'n Move Stroller! If you're in the market for a light weight umbrella stroller that still offers some of the same amazing features as a full size stroller then you're in luck! With the City'n Move stroller by Kiddy USA you get all of the benefits of a full size stroller in a compact umbrella stroller! 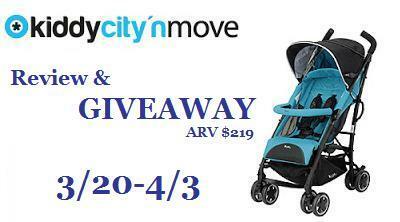 The City'n Move is even certified by the AGR Campaign for Healthier Backs! To read the full review on the Kiddy USA City'n Move and enter the GIVEAWAY check out Mommys Craft Obsession!